Inverness is a thriving city located in the south of the Highlands, on the banks of the River Ness. Inverness offers a fantastic variety of things to see and do from shopping, culture to eating and drinking in one of the many lovely riverside restaurants. Urquhart Castle offers a taste of the Highlands at their most dramatic, the jagged ruins of this impressive structure overlook Loch Ness. 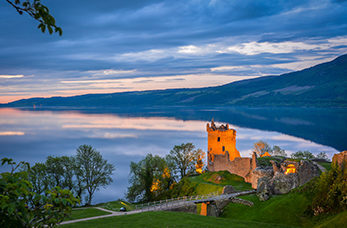 Visit one of the most popular attractions in Scotland, Loch Ness. Enjoy some of Scotland's finest scenery, explore the history of the area and see if you can spot he legendary Loch Ness Monster! This magnificent castle, perched on a high terrace above walled gardens dates back to the early 1300s. Take the opportunity to experience some of the greatest history, culture and wonderful scenery. Culloden Moor was the site of the bloodiest Jacobite battles when the British troops defeated Bonnie Prince Charlie and the Highland clans in 1746. The visitor centre features state of the art exhibitions that bring the battle alive.